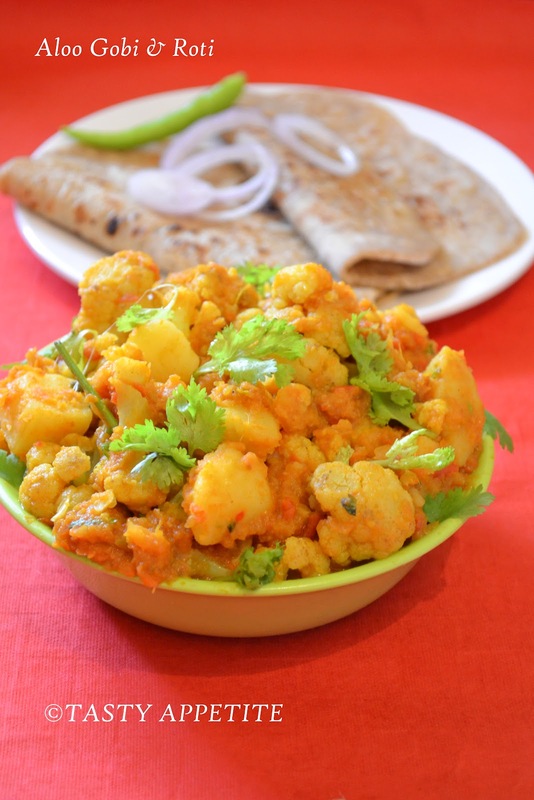 Aloo Gobi is a very popular North Indian vegetarian dish. 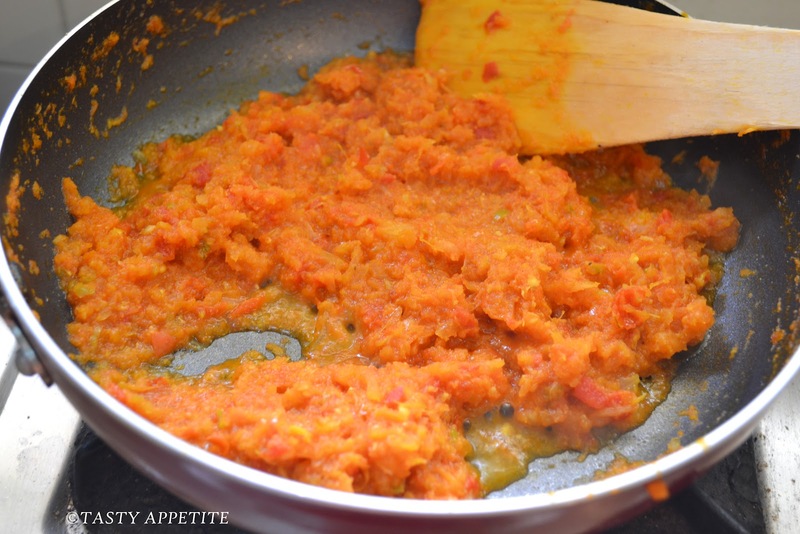 This is a dry version and it makes a winning combination with rotis, naan, paratha or puris. This delicious main dish is made with potatoes, cauliflower & cooked in an enticingly fragrant blend of spices. 2. 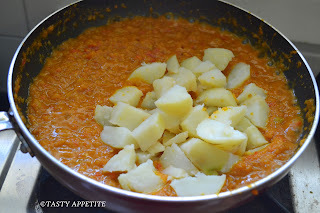 Boil and cube potatoes and keep ready. 3. 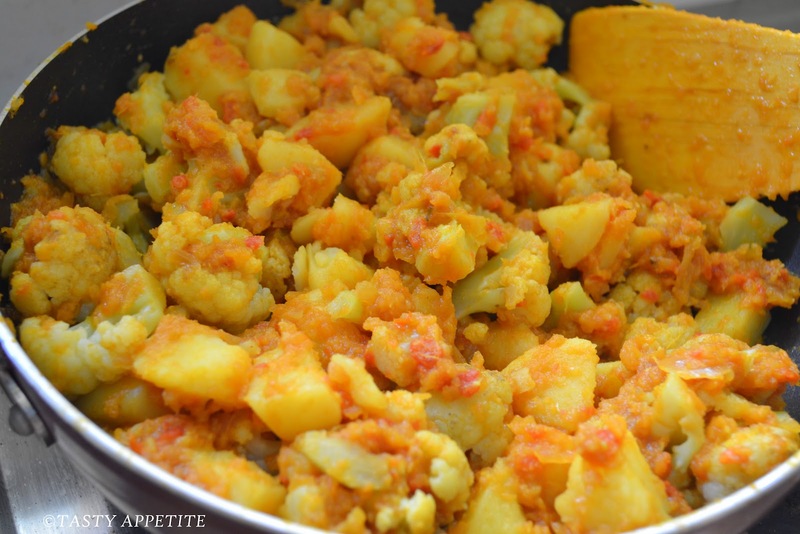 Slice cauliflower to fine shreds. 4. 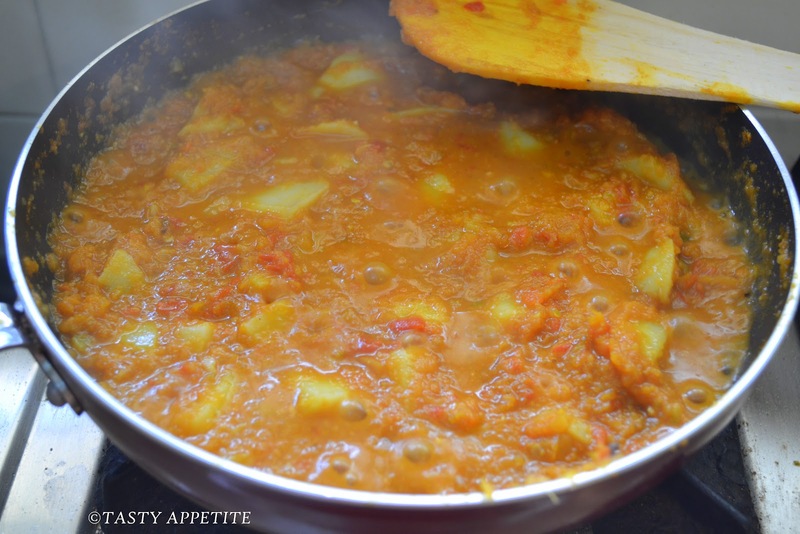 Cook it covered in a pan, by sprinkling little water and keep ready. 5. 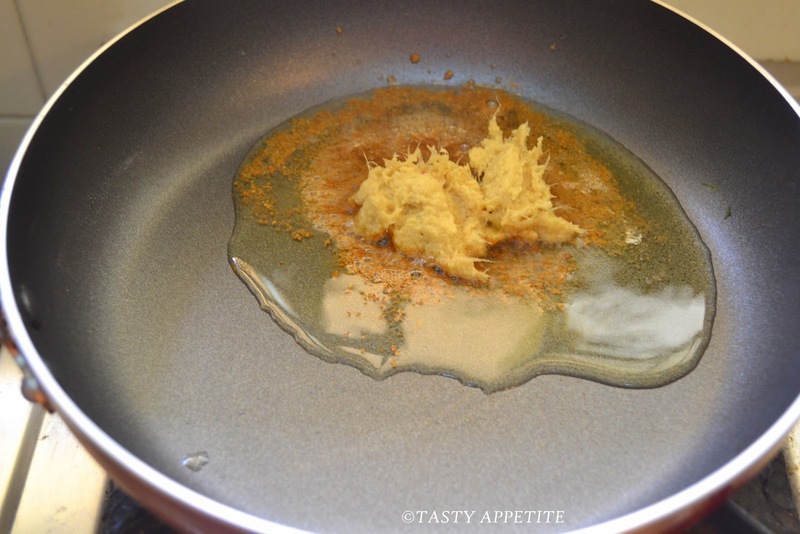 Add oil to the pan and heat it. 6. 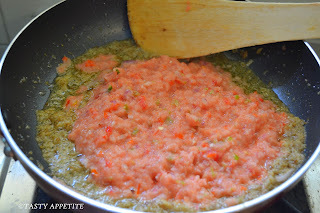 Add cumin pwd , hing, sauté for few seconds. 7. Add ginger garlic paste and fry further. 8. 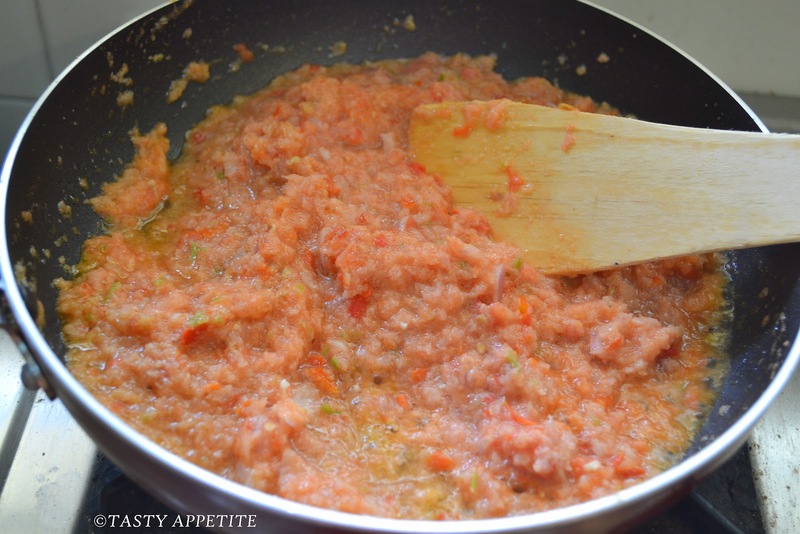 Mash onion, tomato and green chilly coarsely. 9. Add this paste to the pan and sauté for 5 mins in medium low flame. 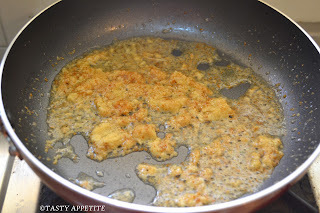 Fry till oil separates out of masala. 10. 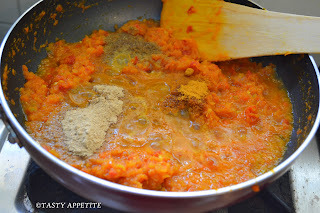 Add turmeric pwd, coriander pwd, red chilly pwd, salt, kasthoori methi pwd and amchur pwd. 11. Sauté well in low flame for 2 to 3 mins. 12. Now add boiled and cubed potatoes. 13. 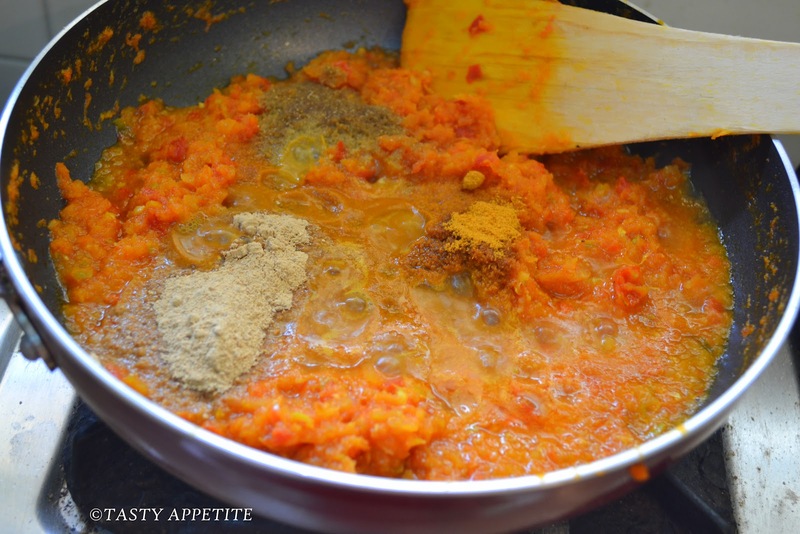 Combine well in the masala. 14. 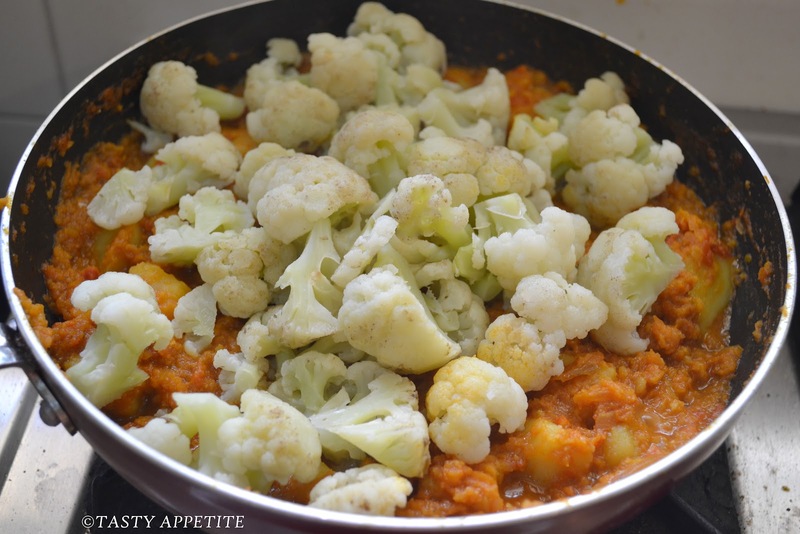 Add cooked cauliflower and mix gently. 15. 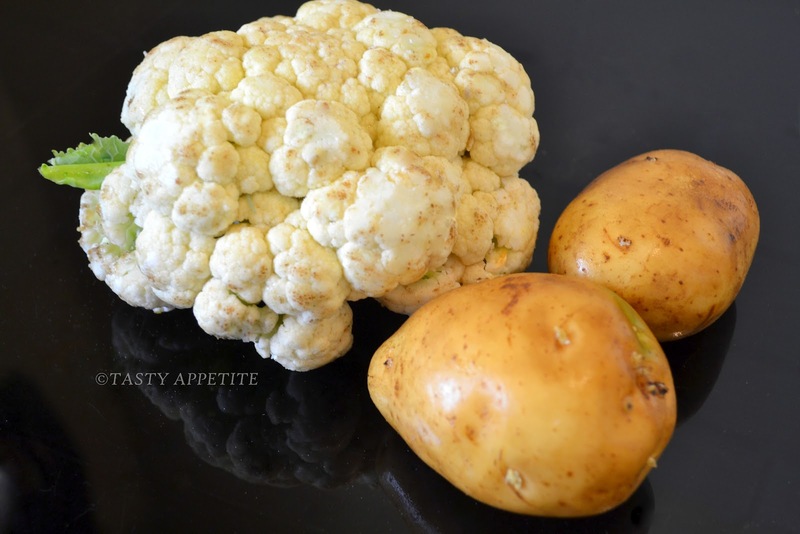 Take care not to smash the cauliflower florets. 16. 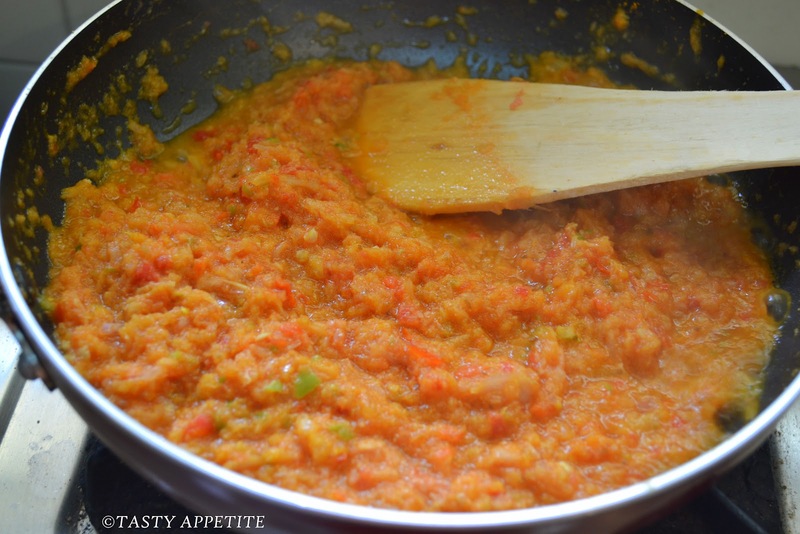 Cook it covered for 2 minutes in simmer. 17. 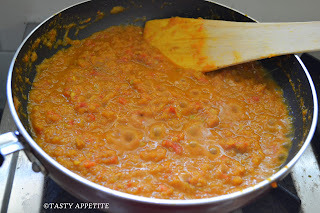 Sprinkle garam masala pwd and turn off flame. 18. 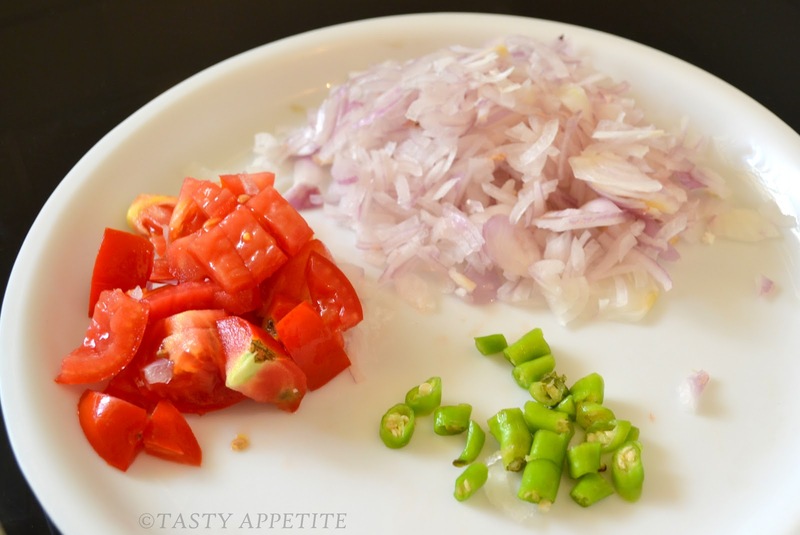 Garnish with freshly chopped coriander leaves. 19. 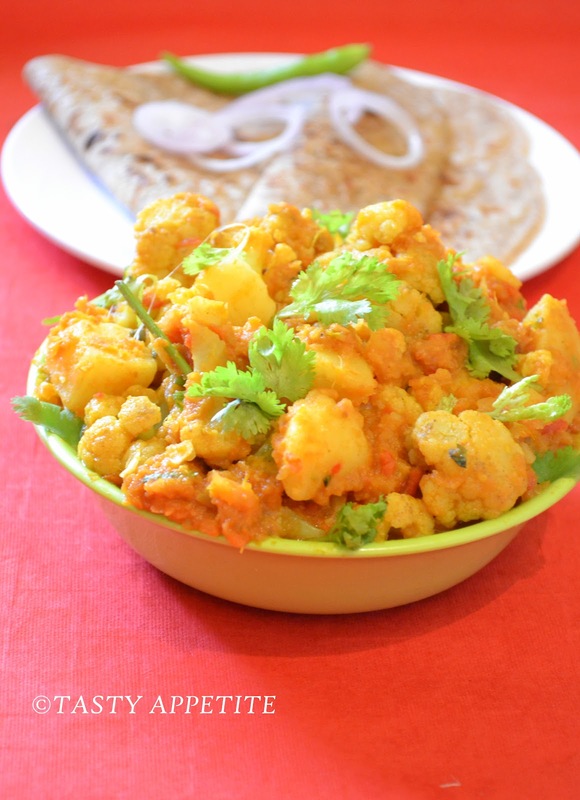 Tasty & healthy Aloo Gobi ready. 20. Makes a delicious combo with rotis or chapatis..! 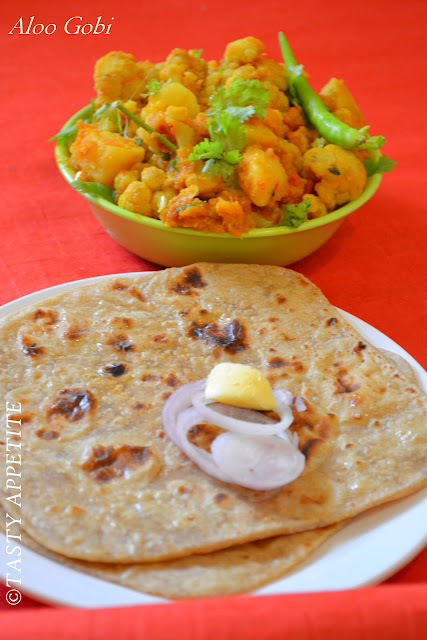 yummy side dish for pooris or chapathis..nice SBS photo presentation! 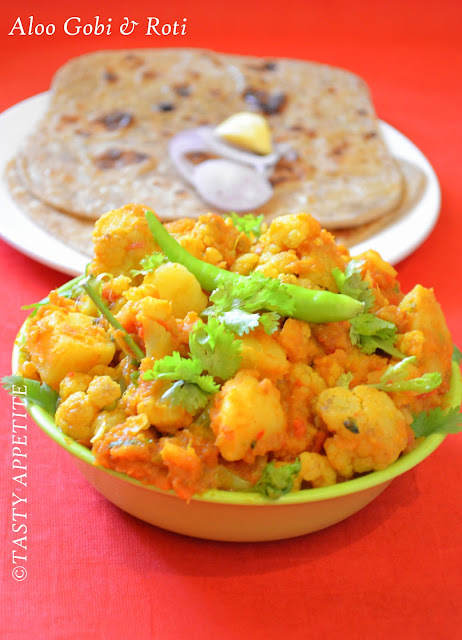 Yummy sabji..loved the rotis too.and the clicks are awesome. Yummy flavorful one jay..Who can resist ? Looks divine. 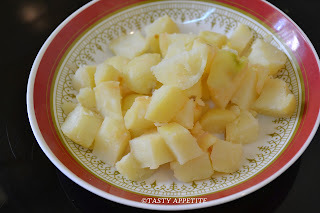 Very delicious and goes well with roti/rice both. lovely dish dear. you made it so well. perfect aloo gobi masala...looks very tempting!! 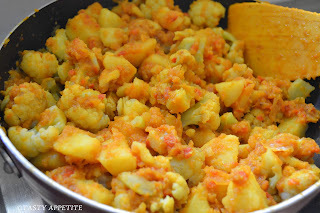 Aaloo gochi is my favorite dish... Yummmyy!!! Lovely pictures, flavorful Aloo gobi. Super inviting pictures and love this curry.. 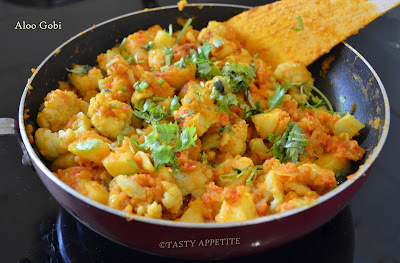 Perfectly done aloo gobhi.looks tempting.. Simple , yummy and delicious! Looks so bright and yummy jaya..
Drooling here, one of my fav dish,excellent side dish for rotis. 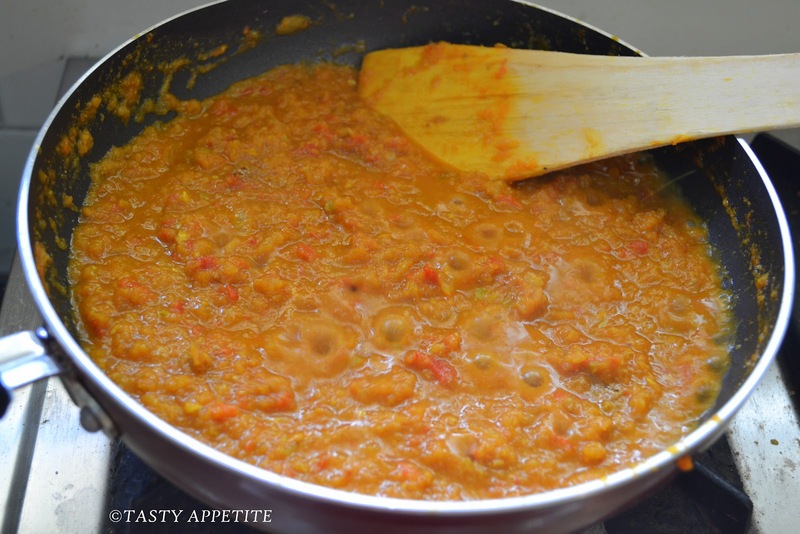 So glad I saw this recipe on your site...love this and will be making this soon! Thanks for the recipe! Delicious looking dish. I love it too. This is one of my favorite dishes when I eat out at an Indian restaurant. I'll bet you spice it up more than they do! What ingredient(s) would you suggest cutting back on for someone -- like me -- who can't eat it too hot? Gorgeous photos, as usual, Jay. 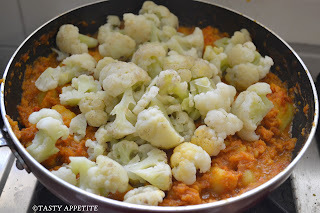 Another classic side dish...absolutely love it Jay!